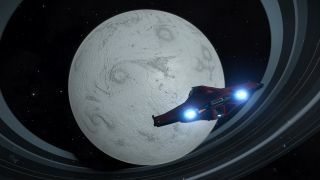 When you see a planet in Elite Dangerous, you could be forgiven for thinking it was just a big sphere with a texture wrapped around it. But everything in the game’s Milky Way is generated according to real science by a system called the Stellar Forge, and a dizzying amount of data goes into generating those beautiful alien worlds. I asked Frontier to explain how it all works. Stable orbits are then determined for objects formed from the materials in the disc clumping together. Passing comets and rogue planets are also thrown into the mix, to disrupt the orbits and create fledgling planets and moons. The planets created through this process can finally be classified depending on the resulting remaining atmosphere, surface liquids, ground and tidal activity, be it a gas giant or a terrestrial world. “And all of this," says Ross. "Happens in a fraction of a second on your CPU."